This Total Eclipse of the Sun is known as the 'Great American Eclipse' because it will cast a 70-mile-wide shadow path over parts of 12 states across North America, from Oregon to South Carolina. This eclipse will affect each and every one of us, no matter where we are on the planet. However, for those who are in the path of totality (where all of the Sun's light is blocked by the Moon for about two minutes), the influence will be strongest. To see a map of the path totality, click here. To view a video of the path of totality across the United States, click here. The fact that the United States is the only country that the shadow of the eclipse is falling on is very significant. We are at a breaking point in our country, and the evolutionary forces are pressing us to choose what to do about it. We are about to reach a crossroads where we must make some major defining choices. A Solar Eclipse always occurs at a New Moon, which marks both the endings of old ways of being and the beginnings of new patterns of energetic manifestations. This Solar Eclipse symbolizes a new paradigm of foundational new beginnings and new ways of being for Humanity that will play out for eternity.These include new beginnings of ways of loving, new beginnings of ways of being with family, new beginnings in ways of being in our relationships with friends, new beginnings with our careers – essentially, new beginnings of almost everything in time. This Solar Eclipse is very significant in many unique and extraordinary ways. It brings us the opportunity to use the creative energies of the Universe for our personal and collective benefits. New frequencies will be downloaded into the Collective Consciousness for healing our world and our personal lives. Within these universal energies are codes that will unlock the doors to a new paradigm of freedom, Truth, unlimited power, Great Love and miracles. This new paradigm is potentiating the spiritual growth and healing of Humanity. The awakened heart grows and expands greatly through surrendering to Divine Guidance and Inner Knowing. The perfect way to do this is through meditation, reflection, concentration, visualization and imagination. In a Solar Eclipse, the dark side of the moon is exposed to us while the light of the Sun is being blocked. Symbolically, this represents an opportunity to recognize unconscious emotions (the Moon) that drive our ego (the Sun) and make the unconscious conscious. If we open our hearts, this can reveal the way to heal our self-limiting patterns that we may increase clarity, joy, freedom and personal power. Do not let fear limit you – let go and trust in the Divine now. In the Great American Eclipse, there is a Grand Trine in the Fire Element configuration (see the Green Triangle) that includes the North Node, Sun, Moon and Mars in a Stellium (a large Conjunction of celestial energies, all in Leo), Saturn (in Sagittarius) and Uranus (in Aries). The energies of this Grand Trine supports us to create expansion, abundance and success in whatever we initiate that serves the highest good of all. This positive alignment includes Uranus in a Trine Aspect with Saturn. Saturn is about the fundamentals. It represents the structures of things and the principles that we live by. With this eclipse, the Universe is saying, "It's time to be courageous, expand and go bigger." Now is the time to stand courageously and enthusiastically in your power. In other words, take inspired action with positivity and confidence about what you believe in. If you stand in authority as a spiritual being (which is Saturn in Sagittarius), the Universe will support your success and personal evolution. There is also a Grand Cross configuration in this eclipse involving four planets (see the Red Cross): Venus (in Cancer), Jupiter (in Libra), Pluto (in Capricorn) and Uranus (in Aries). This is perfect, because it is calling for accountability on how we use our resources and how we use our spirituality and philosophy. This is challenging us to take responsibility for our choices - to see where we might be going in the wrong direction, how we are limiting our power, and where we are blocking our true potential and evolution. 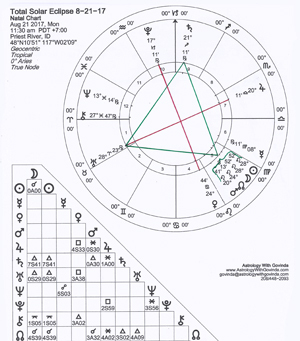 This is a profound Grand Cross! It is both a wake-up call and a nudge from the Universe to release all that we are attached to – including our financial comfort zones, our possessions, other people, careers, philosophies and so on - that are not serving our higher good. Uranus acts as the attachment buster. The word "attachment" doesn't mean what you think it means. When you are "attached" to something or someone, you are coming from a place of separation. Feeling separate brings fear and the need to control. Look around you and notice that anywhere you are trying to 'control' a situation or person, you are attached. Anywhere that you feel 'fear' for your survival if this situation were to change – this is where you are attached. Attachments restrict your freedom and will ultimately cause you suffering. Now, this doesn't mean that you have to abandon your friends and loved ones. It means that you love from your Sacred Heart Space and recognize your Unity with all beings. When you are unified with the whole Universe, there is nothing outside of you, and nothing to attach to. The irony of this is that those things you are attached to and afraid of not having may naturally come to you when you let them go, live completely in your heart and trust. Uranus shakes up, breaks up and removes whatever is out of harmony with Divine Order. It's the Christ Consciousness planet. If you are not listening to your spiritual guidance, the problems and chaos in your life will get bigger and more uncomfortable. A good question to ask yourself is, "Am I living deliberately for the highest good of all or are am I living something else?" If it is 'something else' it will become so magnified and dynamically disturbing that people will be forced to wake up out of their functional comas. For those who are on the path of service to Love, Higher Truth and the wellbeing of Humanity and our Environment, this is an eclipse to look forward to. There are powerful energies for expanding success, prosperity and healing. Live consciously and deliberately, especially on the day of the Solar Eclipse. Take a moment on this day to do a special ritual, prayer, meditation or whatever uplifts you. In your heart, connect with this profound energy. In other words, commune with Spirit in your own way. Visualize and verbalize what you are wanting. State your intensions out loud. Express affirmations from your heart. Feel and express appreciation for everything. During the entire day, do a "Negativity Fast". Choose not participate in anything that causes you to spiral downward energetically. Decline the invitations to any drama that may come your way. Stay away from negative news on the television, the internet, all of the social media venues. Only speak positive and uplifting words and participate in Acts of Kindness. The bottom line message of this Leo Sun eclipse is that we must become as children and open our hearts to expressing love without reservation. This is a time for increasing romance, fun and playfulness. Awaken the inner-child and allow our children to guide us. It's a wonderful thing to embrace this Eclipse with awareness and take advantage of the knowledge of how it affects you personally so you can take conscious and deliberate action to empower the remainder of your life. If you are interested in understanding how the profound energies of this Total Solar Eclipse are permanently imprinted into your life, I am offering a 60-minute reading by phone that is personal to your natal chart. In this reading, I will show you how the Solar Eclipse overlays your Natal Chart and describe how and where you are affected by new energies imprinted by the Eclipse for eternity. 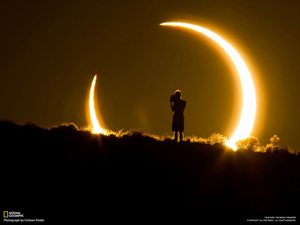 I will explain how you can use the energies of the eclipse to enhance, heal, empower and bless the rest of your life.